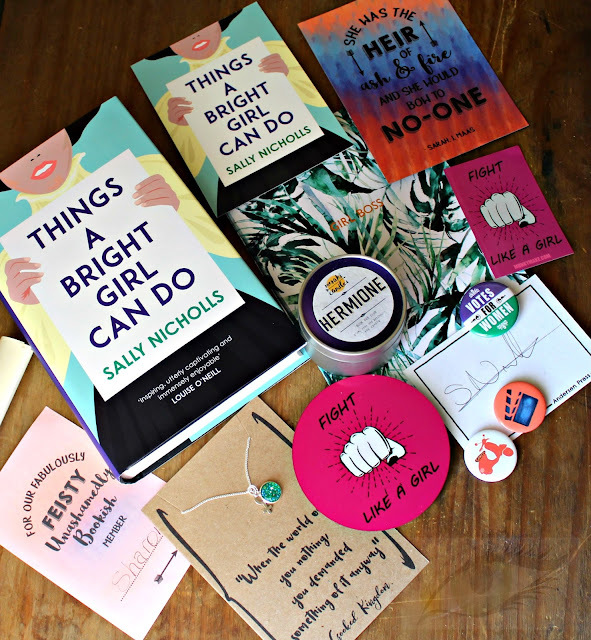 I received my August "Fearless Females" box from Book Box Club earlier in the month, but held off a little in case I'd spoil it for anyone. The theme was perfect - I love anything to do with strong women, so I was really looking forward to this box. 1914. The world stands on the edge of change. But women still have no vote. Evelyn is seventeen, and though she is rich and clever, she may never be allowed to follow her older brother to university. Life is set out for her: dances, tea parties, and marriage. But Evelyn wants freedom and choice, even if it means paying the highest price alongside her fellow Suffragettes. And then there's May, who campaigns tirelessly for women's votes and fair pay with the other anti-violence suffragists. When she meets Nell, a girl who's grown up in hardship, she sees a kindred spirit. Together and in love, the two girls start to dream of a world where all kinds of women can find their place. But the fight for freedom will challenge Evelyn, May and Nell more than they could ever imagine. As the Great War looms, just how much are they willing to sacrifice? 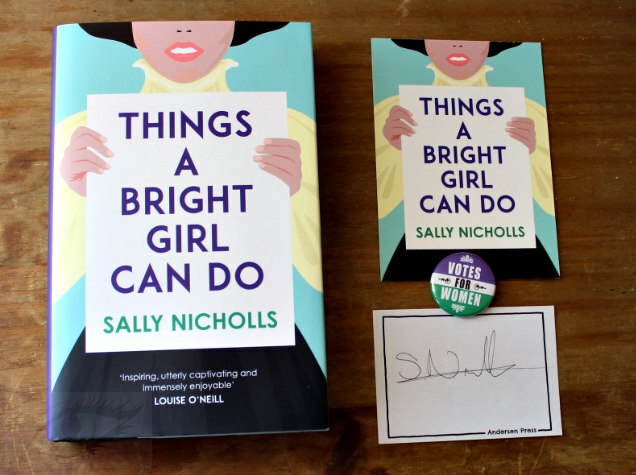 The hardback copy came with a signed bookplate, Votes for Women badge and a promotional postcard. 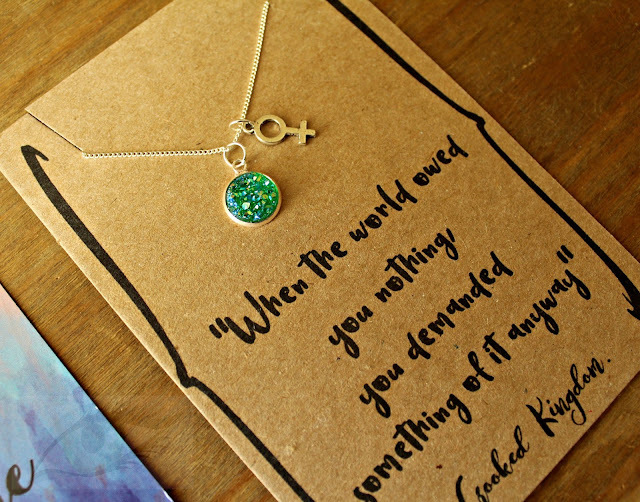 Also included were a massive fridge magnet with a quote from Heir of Fire by Sarah J. Maas (designed by Book Box Club). That came with the little paper with my name on it - Libby and Kate always go out of their way to make sure that at least one item in the box has a personalised touch, which I really appreciate. 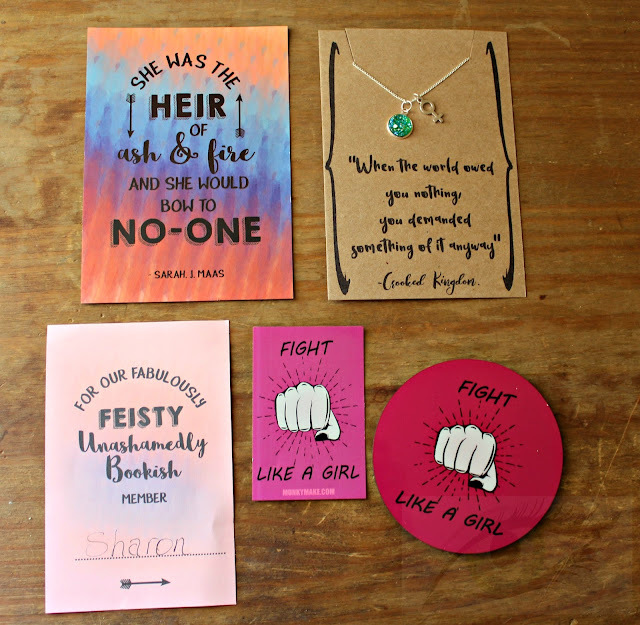 The Fight Like a Girl coaster and sticker are by Munky Make, and the feminist necklace is by Compton Four. I'd love to see more magnets included, I use magnets a lot and I'm a big fan of all things Sarah J. Maas at the moment, so I was really delighted with that. 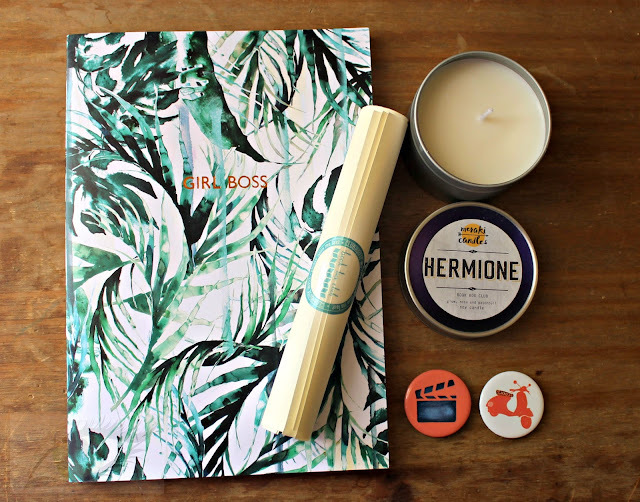 Finally, we had a Girl Boss notebook by Nikki Strange Design, a Hermione candle by Meraki Candles that smells delicious - I can smell a kind of posh version of the purple Chewits, but it's plum, rose and patchouli. Really gorgeous. Also included were some promotional badges from Alex, Approximately by Jean Bennett and the usual Book Box Club scroll that contains information about this month's author and the upcoming club meeting. I'm so glad I changed over from Owlcrate - this box is well worth the money (I pay just under €33 a month depending on exchange rate) and the contents are always useful as well as pretty. Another great box!